A new smartphone accessory developed in Europe claims to be able to help farmers calculate the weight of cattle from metres away in a paddock or feedlot with 95 percent accuracy, without having to run them over a set of scales. Hungarian-based tech development company Agroninja says the accessory ‘s stated accuracy has been proven in over 5000 tests. 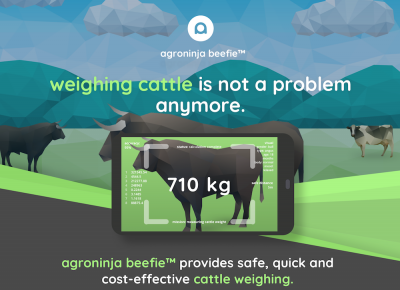 Agroninja announced the “Beefie” product at Eurotier earlier this month, Europe’s biggest exhibition for the farming industry, and is now launching the innovation globally. Agroninja describes Beefie as an easy-to-use tool that enables a herd manager to get an accurate record of weight on any animal in their herd in less than a half minute without touching the animal or the need for any special preparation, resulting in zero added stress for livestock and no additional costs for the operation. The technology uses an external device combined with photographs captured from 2-6 metres distance with standard Android 5.1+ smartphone systems. “It calculates weights and gives 95pc accurate results, even when animals are in motion or partially obscured. The application takes into account the condition, breed, gender, age and general appearance of the animal based on user input, and creates an entry with the animal’s individual ID number and photograph that is always available for instant reference, even offline,” an Agroninja media release launching Beefie states. Gergely Boromisza, the co-founder of Beefie, said the Hungarian team is now working on expanding its distributor network to Greece, Germany, France, South Africa, Australia, New-Zealand, Brazil and also to the United States and is currently accepting reseller partner inquiries. can you give me information on the agroninja and is there a cost for it or can you use it through an app?